When it comes to party appetizers, we always try to squeeze as much flavor as humanly possible into a bite size. This can sometimes be a bit of a challenge, especially when that flavor involves saucey, cheesy goodness, but our girl Sarah at Broma Bakery has done it again! 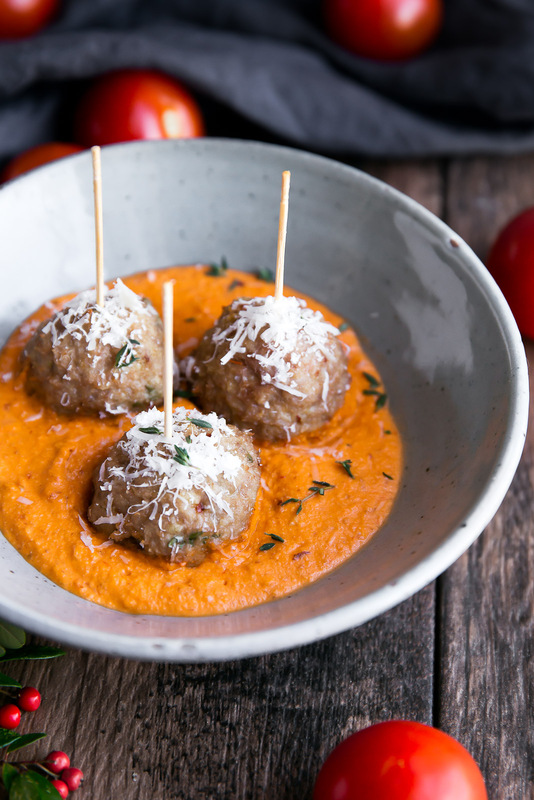 Introducing Turkey Meatballs with Homemade Romesco sauce, the perfect party appetizer. It's so easy to make, and you won't feel guilty about going back for seconds... or thirds or fourths. Preheat oven to 375°F. Remove stems from Campari Tomatoes and place on a large cookie sheet along with garlic cloves. Drizzle with 2 tablespoons olive oil, then toss until combined. Roast for 30 minutes. Once the tomatoes are out of the oven, turn the oven to 400°F. In a large bowl, combine all meatball ingredients. Roll meatballs into roughly 1.5 ounce balls, then place on a silpat-lined cookie sheet. Bake for approximately 20 minutes, or unti the meatballs are fully cooked in the center and no pinkness remains. 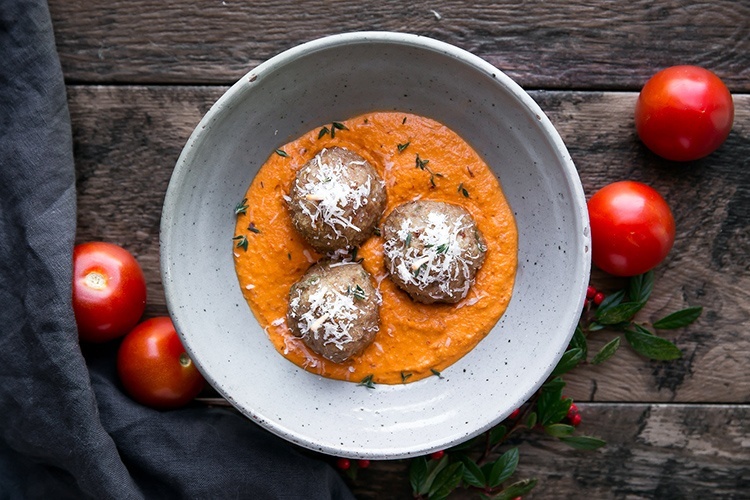 While the meatballs are cooking, make the romesco. In a food processor, combine the roasted tomatoes, garlic, almonds, salt, red pepper flakes, and vinegar. Slowly drizzle in olive oil while pulsing ingredients together. Pulse until the sauce is orange and velvety, but still slightly crunchy. When ready to serve, place romesco sauce on the bottom of a large bowl or plate. Top with meatballs, then garnish with parmesan. Did you check out our other amazing app from Broma? Trust us when we say your holidays are going to be oh so tasty!